Next up is a song that lets the music fill our heart space. 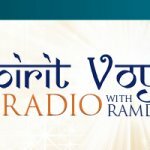 Let go of the pain and stress you carry in your heart, let it melt away into the vibrational frequency of these musical offerings, says Ramdesh. From Satsang listen to “Empty Heart” by Deva Premal and Miten. Empty out and open to greater love. By Snatam Kaur you’ll hear “Every Heartbeat,” one of Ramdesh’s favorites from The Grace Within You Live at Sat Nam Fest. This simple, beautiful song will guide your heart to open like a flower in the sunlight! Relax and feel the ecstasy! Also by Snatam, you’ll hear “Song of Your Heart” from Heart of the Universe. Mirabai Ceiba’s “Burn of the Heart” from Between the Shores of Our Souls brings another loving vibration to the heart theme. This gentle song is followed by Nirinjan Kaur’s “Aad Guray.” This heart mantra of protection and projection keeps you safe and helps you open to love. The track is from Prem Siri, which means great love. When we feel safe we can love; when we trust in the divine we can open our hearts, Ramdesh points out. In closing, listen to Sada Sat Kaur’s “Love in My Heart” from Mantra Masala. This is an uplifting, wonderful track. Listen and feel the vibrancy of heart love! There are so many inspiring things that can wake up the love in our hearts, Ramdesh notes. Open your heart to greater love with these pure vibrations. As Yogi Bhajan said, “Where there is love, there is no question. Where there is love, there is no pain. Where there is love, there is nothing impossible.” Love, live, and enjoy!